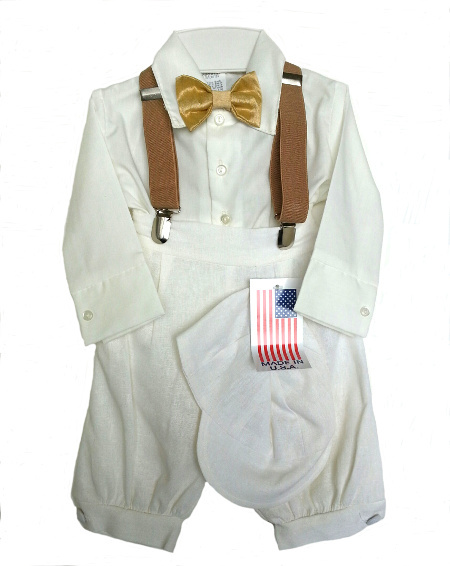 DapperLads - *Exclusive* Boys Ivory Knicker Set w Gold Bow Tie - Knickerbockers - US made Victorian fashion boys knickerbockers sets with genteel nostalgic appeal. A DapperLads Design, this ivory linen knicker set portrays understated elegance. Absolutely beautiful for weddings, christenings and special occasions. The 5-piece set includes an ivory shirt, a gold silk clip-on bow tie, a pie cut hat, cappuccino color elastic suspenders, and ivory knicker pants. The shirt is a 65%-35% cotton-poly blend. The knicker pants are a linen polyester and with an elastic back. The outfit runs fairly true to size but the hats can be small. The hat has elastic in back.